Multi-room audio is nothing new, especially if you are a seasoned Chromecast user. All around our office we have Chromecasts and Cast-enabled speakers and each is assigned to various speaker groups to fit whatever audio needs that may arise. It’s a great feature and likely underused by most consumers and until recently, not available on the Chromecast video streaming dongles. XDA first spotted the update in the Preview Program of the Google Home App last week and now it appears the feature is live for most users. The use-case for grouping a Chromecast audio is pretty narrow at the moment but it is nice to be able to group it with another speaker and stream music while keeping the Chromecast’s wallpapers playing on the TV. I suppose it would come in handy if you were playing music throughout your home and wanted to display holiday photos of the family or show off pics of your kids at their birthday party while playing party music. I’m sure you can come up with some other (better) ideas than I can. It’s just cool to see this addition. A larger addition to the multi-room audio landscape was discovered by Paul Thurrott. 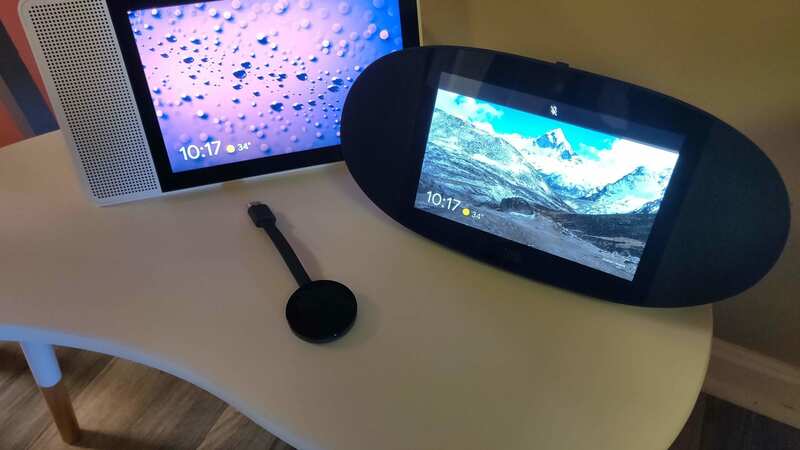 In testing out the Chromecast’s new feature, he realized that his Lenovo Smart Display could also be added to speaker groups. Honestly, I never understood why this wasn’t a feature out of the gate. With devices like the JBL Link and upcoming LG ThinQ Display that focus on premium sound, the ability to group them with other cast devices seems like a no-brainer. I have the JBL Link View in the window by my desk and the Google Home Max is on the other side of the office. While the Max produces more than enough sound to fill the room, adding the JBL to a group lets me play music on both while keeping the volume at a level that won’t shake the pictures off of the wall. The multi-room audio function adds a whole new dimension to smart-displays and can give your audio game a major shot in the arm without having to invest in more costly speaker alternatives. Even better is the fact that Chromecasts are discounted across the board for Black Friday. You can grab the latest version of the video dongle for only $25 at the retailer of your choice. You can also save $50 on the JBL Link View and $100 on the 8″ Lenovo right now. Not too shabby.